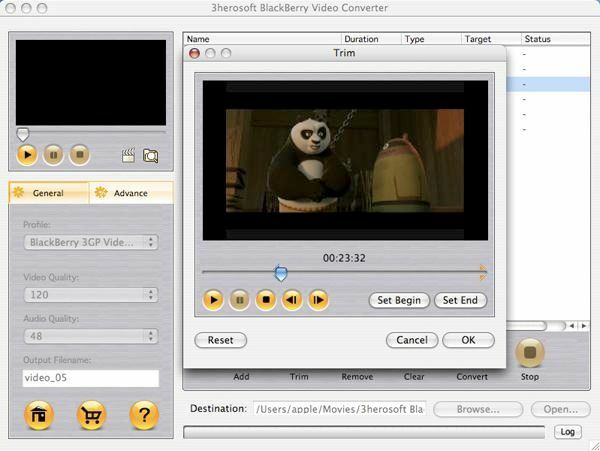 3herosoft BlackBerry Video Converter for Mac OS X is a conversion tool that can accept a large number of input multimedia files and output content formatted for BlackBerry devices. With this powerful BlackBerry Video Converter, the output video and audio files can be perfectly played on different BlackBerry series, such as BlackBerry Strom 2, BlackBerry Bold 9700, BlackBerry 8800, BlackBerry 8830, BlackBerry 8820, BlackBerry Pearl 8800, BlackBerry Pearl 8100, BlackBerry Curve 8300, etc. The source files formats that could be converted by this BlackBerry Video Converter include: MPEG, VOB, MP4, M4V, MKV, MPEG-2 TS, WMV, ASF, AVI, 3GP, FLV, etc. Convert video to BlackBerry Video format including MOV, MKV, MPEG-2 TS, WMV, MP4, 3GP, RM, MPEG, MPG, FLV and ASF video files. Easily extract audio from video to MP3, AMR, M4A, AAC and WMA with 3herosoft BlackBerry Video Converter. Specify the output settings like Resolution, Frame Rate, Encoder and Bit Rate to meet your need. Allows you to get any clips from your video sources. You can get it by set the exact length time and duration values. The trial download has some limitations that can be removed by registering the software. Note: This version of 3herosoft Blackberry Video Converter for Mac OS X is intended for use with an Intel processor. For PowerPC, click here.